It is WPML ready and includes .po .mo language files. Some highlights include edge to edge display of portfolio and blog post images and videos. Smooth non-intrusive flip menu on view (when scrolled out of view and once visible). Toggle based Dashboard sidebar (widgetized ). 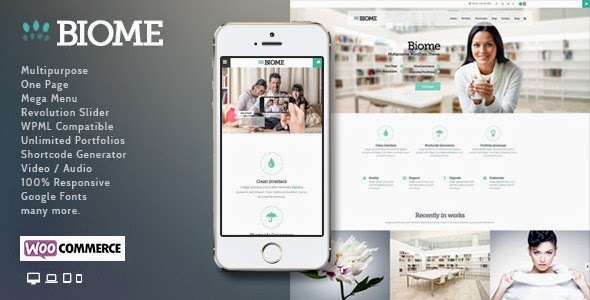 Item Reviewed: Biome Multipurpose One Page WordPress Theme 9 out of 10 based on 10 ratings. 9 user reviews.